So which water purifier is better between Livpure Touch Plus and Kent Grand Plus? There are many similarities in this to water purifier that’s why many consumers have this question and probably you too that’s why you are here. No worries in this Livpure Touch Plus vs Kent Grand Plus comparison article I’m going to share all the similarities and differences in these two water purifiers which will help you to choose the ideal water purifier for you between these two water purifier. Livpure Touch Plus vs Kent Grand Plus both have almost same water purification technology. Also the water storage capacity is same. Most of the difference is in the design and the additional features (more about that below). First lets look at he the design and build of these two water purifiers. Both water purifier are made from Food grade plastic which is non-toxic and durable as well. Livpure Touch Plus has a very unique looks and a small digital display. You have to choose what kind of water dispensing you want from the three options it provides (one glass water, one bottle water or continuous water flow). Once you have chosen what kind of dispensing you want it will start dispensing the water automatically. It also has manual Valve for dispensing as well. It also comes with a menu which has some options which will give you data about quantity of the water consumed, filter life of this water purifier, purifying water level and customer care number. Now let’s talk about design and build of Kent Grand Plus. Kent Grand Plus has a very traditional look. The filters of this water purifier are visible with a transparent cover on it. Below the filters there is a water storage tank which is fully covered but it has a water level indicator. So as you can see Livpure Touch Plus has modern unique trendy look whereasKent Grand Plus has a very traditional look. Livpure Touch Plus has a digital display whereas Kent Grand Plus does not have any kind of digital display. Livpure Touch Plus has a unique system for dispensing of water where as Kent Grand Plus has a traditional tap for dispensing. Both water purifiers comes with notification indicator which will notify you whenever you will have to change the filters. First let’s talk about the purification of Livpure Touch Plus. Live pure Touch Plus complete its water purification process in 7 stages. The first stage of purification is of Pre-filter which removes visible impurities likes sand, mud and dust from the water making it clean and clear. The second stage of purification is consist of sediment filter which removes sediments and other suspended dirt impurities from the water. 3rd stage of purification has pre-activated carbon filter, which basically absorbs harmful chlorine and chlorine by-products, pesticides, herbicides and also bad taste and odor causing contaminants from the water. The Fourth Stage of purification has antiscalant filter. This filter basically works as an protector for the RO membrane. It removes the layer forming salts which could get deposited on the RO membrane, which improves the purification capacity and also increases the life of RO membrane. Once the layer causing salts are removed from the water then the water is filter by RO purification at the fifth stage. The RO purification removes remaining dissolved solids and solids from the water it also removes heavy metals like Mercury, Arsenic and Lead from the water, which basically softens the hard water. The 6th stage of purification is of UV disinfection. In this page of purification water is introduced in the UV disinfection column, where it gets exposed to the UV rays of the usable which inactivate harmful bacteria, viruses and protozoa from the water making it Microbe-free. The seventh stage of purification is of ultra filtration which is consist of UF cartridge. This stage of purification removes cyst and other remaining physical impurities from the water. This water purifier also has a taste enhancer which will enhance the test of the purified water by adding essential minerals in it. Now let’s talk about the water purification process of kent Grand Plus. Kent Grand Plus complete its water purification process in 6-stages. First stage of purification is consist of sediment filter which removes physical impurities like sand, mud, dust from the water. The second stage of purification has activated carbon filter which removes chlorine and Chlorine by-products as well as bad taste and odour causing contaminants from the water. The third stage of purification is of RO filtration. This stage of purification has a RO membrane. Water is passed with a great force through RO membrane which remove dissolved solids and solids from the water as well as heavy metals like Mercury, Arsenic and Lead. Fourth Stage of purification is of ultra filtration. This stage of purification has UF membrane which removes remaining visible impurities from the water making it clean and clear. Ultraviolet purification comes at the fifth stage of purification. In this purification stage water is exposed to the UV rays of the UV bulb which inactivates harmful bacteria and viruses from the water. The 6th stage of purification has post carbon filter which enhances the taste of purified water by adding essential minerals in it. Kent Grand Plus comes with a TDS Controller as well, which help you to control the TDS of the water. It helps to retain the essential minerals in the water. So as you can see both the water purifier have same water purification Technologies i.e. RO, UV and UF water purification Technology. There are some changes in the filters of these two water purifiers but they ultimately performs the same water purification operation. So there is not a big difference in the water purification process of these two water purifiers. Live pure Touch Plus comes with 8.5 litre water storage tank whereas Kent Grand Plus comes with 8 litre water storage tank. Livpure Touch Plus come with filter change indicator which will notify you whenever you will have to change the filter. Kent Grand Plus also has the same notification system it has two LED indicators which will notify you whenever you will have to change it’s filter or UV bulb. First let’s talk about additional features of Livpure Touch Plus. By choosing this option this water purifier will dispense water enough for filling a glass of water. By choosing this option the water purifier will dispense water enough for filling a water bottle which will be around 1 liter. By choosing this option the water purifier will dispense the water continuously until you switch off the water flow. Besides these 3 options, this water purifier also comes with manual valve for dispensing purified water. This water purifier also gives you additional data like the quantity of water consumed in it’s menu option. Kent Grand Plus comes with a built in SMPS which basically works as an voltage stabilizer and it stabilizes the high voltage current during voltage fluctuations by converting High Voltage DC current into AC current, ensuring no harm will cause to the water purifier during voltage fluctuations. This water purifier is equipped with spin welded RO membrane which is basically damage proof and cannot get damaged by physical impurities like sand, mud and dirt, which insurance the long life of RO membrane. Usually water purifier comes with 8 watt UV bulb but Kent Water Purifier comes with 11 watt UV bulb which are more effective in inactivating harmful bacteria, viruses and protozoa was from the water. All the components of this water purifier or push fit which basically means that, they are attached to each other in such a way that it will not cause any kind of water leakage. So as you can see there is not a big difference in the purification process of these two water purifiers, except Kent Grand PLus comes with a TDS controller. Both the water purifiers have almost same water storage capacity and alert system. The main difference between these two water purifiers is in additional features. Livpure Touch Plus comes with a unique multistage dispensing option whereas Kent Grand Plus has traditional tap for dispensing water. Also livpure Touch Plus will provide you some additional data. On the other hand, Kent Grand Plus has a built in SMPS which works as an voltage stabilizer. A spin welded RO membrane which is basically considered as damage proof. Hi-power UV bulb which is more effective in removing harmful bacteria and viruses and push fit components which basically prevents Water leakage. So if you are looking for a water purifier with unique looks and features then you should go for livpure touch plus, whereas if you want water purifier with essential useful features and you are not too much concerned about the looks then you should go for Kent Grand Plus. 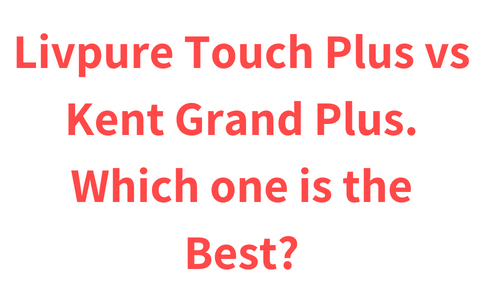 That’s all about Livpure Touch Plus vs Kent Grand Plus comparison article. I hope you found this comparison helpful. Let me know if you have any questions in the comments section below. I’ll try my best to answer your queries. Comparison Between Aquaguard geneus and Kent Grand Plus. Comparison Between Pureit Ultima and Kent Grand Plus. Livpure Envy Plus vs Kent Pearl.